Back in September 2017, we were delighted to be contacted – completely out of the blue – by Toño Peña, the Vice-President of Biciclistas de Corella, a Spanish organisation promoting the bicycle as a means of transport. He was inquiring to see if Cyclist.ie would like to be a partner in an Erasmus+ project funding application he was leading on. The project was to be all about social inclusion, youth empowerment and sustainable transport. The answer was an emphatic ‘yes’! Roll on March 2019, and after many months of SKYPE calls, emails, Garda vetting of volunteers and navigating labyrinthine forms for EU projects, we were part of an exciting partnership and on our way to the lovely town of Corella in the the region of Navarra. In the intervening period, Cyclist.ie had teamed up with Green Schools Ireland, and the other project partners were Frie Fugle and Cycling Without Age from Denmark, a youth association (LAG Suduva) from Lithuania, and the Alhama High School and Biciclistas de Corella in Spain. Crucially, on board with the adults from the cycling and environmental organisations above were school children from all four participating countries – around half a dozen from each. The pupils from Ireland came from St. Tiernan’s Community School in Dundrum. The adults comprised Dr. Damien Ó Tuama from Cyclist.ie, Jane Hackett from Green Schools, Martina O’Shea linked to the school, and Allison Roberts from Clonakilty Bicycle Festival (who was joined by her partner Justin and three year old Ari, all of whom were on bigger bicycling and camper-van adventures in Spain and Portugal at the time!). All 40+ participants who travelled to Corella were treated to a wonderfully diverse and amazingly action-packed week of activities. 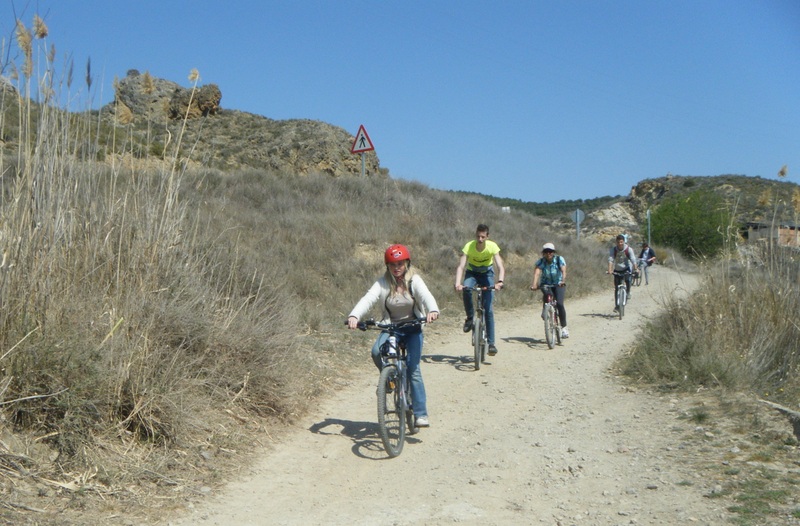 We have to say that the crew from Biciclistas de Corella were the best hosts ever! Each day was jam-packed with formal and informal, indoor and outdoor, day-time and night-time activities of every type imaginable. Some of the highlights included a tree planting workshop, a lovely 40km cycle through a farming region to Fitero, a trip to the Bardenas Desert with a picnic and barbeque afterwards, a dancing workshop, a pottery-making session, singing jotas with the residents of the nursing home and then heading out with them on a Cycling Without Age trishaw, evening time dinners with home-made food provided by locals, visits to wineries, a trip to Pamplona and visiting the palace of Navarra, tortilla-making workshops, meeting the Mayor of Corella, visits to cathedrals….. and lots of presentations on cycling and cycle tourism. It is exhausting listing even some of our activities! Most importantly, we got a lovely warm welcome from the hosts and from everyone we met in the school and on our trips. The first project meeting definitely succeeded in getting cycling campaigners and school pupils from four quite different countries swapping ideas with each other over the course of the week. It was educational, sociable and a breathe of fresh air for us all. Take a bow Toño, Cristina, Quique, Chivvy and team! The next ‘mobility’ or trip for the project participants will be to Dublin in June and – as per the funding application submitted over a year ago – the plan is for the group to be here during the same week as the Velo-city Cycling Planning Conference at the end of June. As far as is possible, we will aim to knit into some of the Velo-city events such as the Cycle Parade and other side events, and Toño Peña himself will be presenting at the conference. Further trips will be to Copenhagen in October and Lithuania in mid 2020 – and then there will be a additional trip back to Ireland in 2021 and we are exploring the idea of heading to Clonakilty for the bicycle festival! To hear more about the project, pop along to the public meeting of Dublin Cycling Campaign taking place on Monday 8th of April – details here – and/or get in contact with Cyclist.ie’s National Cycling Coordinator. Worried about climate change? Frustrated by the government’s inaction on active travel and other measures to tackle emissions? Eager to do something to get your TDs to take #ClimateActionNow? Then join the Stop Climate Chaos Coalition in Buswells Hotel, Dublin, on Wednesday 5th December, for Rise for Climate, Jobs & Justice. Cyclist.ie, a member of the Stop Climate Chaos coalition since 2016, will be participating on the day offering cycling as a real solution to transport climate pollution reduction through the #Allocate4Cycling campaign. Sounds great! But what should I talk to them about? All you need to do is share your real concerns about climate change with your TDs. Tell them that as your elected representative, they and their party should do more to reduce Ireland’s emissions, and that we can’t go on being one of the worst polluters per person in Europe. We took part in similar SCC hosted events previously and those who have participated have found them empowering. Plus, we know that TDs are impacted by meeting groups of their own constituents who care passionately about an issue. A few years ago, running a similar kind of lobby day secured the climate law. Now, we need an action plan that actually cuts greenhouse gas emissions. Warming up for Bike Week! Schools all over County Clare were preparing for National Cycle to School Day taking place on Wednesday 13th of June as part of Bike Week. They organised free bike maintenance and cycle training workshops with An Taisce’s Green-Schools Travel Education officer for Clare, Róisín Ní Gháirbhith. Record numbers of children cycled to school in Clare that day. It is so obvious to me that children now love cycling just as much as we did 30 years ago. It is more important than ever that we create opportunities for children to cycle and look for more investment in infrastructure and speed reduction in order for them to be able to enjoy cycling as a normal way to get around. “It’s the most bikes I’ve seen at the school in 30 years” said principal of Ennis National School. “Children were born to cycle and so few do so regularly now that when you create an opportunity for them to do so, they jump at the chance. They really love being shown how to care for their bikes as well and certainly seemed empowered by the ability to adjust their saddle height, fix a puncture etc. It seems to me that most kids have a bike and pretty good ones at that, but yet they are not really connected to it. I get them to discover the useful information on the tyres, follow the cables to see where they go and what they do. I show them how to adjust their saddle height and the marks on minimum insertion for the seat post. They learn how to use allen keys and spanners and how gears work etc. They love it and it demystifies their bikes and connects them with their bikes. I always say if you take care of your bike, your bike will take care of you. Then I’d cover the essentials of: mounting the bike on the left hand side and why, primary and secondary road riding position, looking over the shoulder, hand signals and cyclists’ rights and responsibilities on the road. Bikeweek 2018 runs from 9th to 17th June with Wednesday 13th June nominated as BIKE TO WORK day. Why should businesses participate? Well if they are interested in congestion, staff productivity, climate change, sustainability and community health, they should – increased cycling has a positive effect on all of the above. On March 6th a number of us plus Stephen McManus of IBIKEDublin, Irish Cycle’s Cian Ginty and a Cycling Ireland crew went to the Sport Ireland workshop on how to #GetIrelandCycling facilitated by Dr. Damien O’Tuama (consultant to Sport Ireland) and Sandra Velthuis. Keynote speaker was Damien’s collaborator Angela van der Kloof, of Mobycon who said unless you have a coherent network of segregated cycle tracks/path criss-crossing urban areas you will not get more people cycling. She said “Children are precious and must be protected from fast traffic”. It was good to see senior officials from Healthy Ireland and Departments of Health and Transport there too along with Road Authorities and Local Sports Partnerships folks. Super. Con O’Donohue of AGS National Roads Policing and two colleagues were also there. We got a chance to speak and harped about the urgency of government appointing a National Cycling Coordinator in Department of Transport along with a team and a promotional budget. We need to keep repeating this as a mantra in public as often as we can. It’s a key recommendation of the NCPF. We were asked to post an estimate of the percentage of commuters who would be using a bike by 2025. I posted 6% nationally; the NCPF called for 10% by 2020! The annual Christmas Walk along the Great Southern Trail Greenway will take place on Wednesday 27th December at 12.30p.m.. Assembly is at the newly opened Longcourt House Hotel (formerly the Courtenay Lodge), St. Mary’s Road, Newcastle West. The hotel is on the N21 and the public bus services stop alongside it. Walkers will be transferred by courtesy coach to Barnagh from where they will walk the 6 miles[10km], all downhill and mostly along the old railway, back to the Longcourt House where they can enjoy seasonal mince pies, whipped cream and tea/coffee at their leisure. All walkers must wear visibility vests as the final section is through the streets of Newcastle West and involves crossing the busy N21 which must be crossed at the zebra crossing close to the hotel. Cyclists, with visibility gear, helmets and lights, are also welcome and we suggest that they also meet at the hotel at 12.30p.m. and cycle outwards along the Greenway for approximately one hour to Barnagh or beyond and then return in time to enjoy the refreshments. Beidh fáilte roimh gach éinne ar an lá. As Christmas is coming a nice gift to oneself or to family/friends would be the Great Southern Trail Limited’s newly published “Limerick & Kerry Railway: Twilight Years” by Liam O’Mahony which is laden with information about the Greenway’s railway history. It is not alone a personal memoir by Liam of the 1950’s to 1980’s railway finale but also reproduces several historic documents. These include a list of the 300 or so shareholders (many of which names are still to be found locally) in the Rathkeale & Newcastle Junction Railway Company which built the line to those towns 150 years ago. Another historic gem which is included is a chapter from “Through the Green Isle”; a Victorian era travel guide which extolled the historic attractions of Adare, Askeaton, Foynes, Ballybunion and Ardfert along with the then newly operational Lartigue railway in Listowel. Liam’s book is very well illustrated with thirty of the photographs being in colour. Twenty full colour railway posters advertising excursion trains to Dublin, Thurles, Cork, Killarney, Knock Shrine and Listowel Races during the 1950’s to the 1970’s will bring back memories to many. Copies of the book will be delivered throughout all of Ireland for €15 (inc.postage). Orders from all of Britain will be £17stg and from all other countries €20 due to overseas postal rates. The book has 187 pages including a 32 page colour section. It is 170mm x 240mm format, soft cover. Enquiries to Liam O’Mahony, 9, Bishop St., Newcastle West, Co.Limerick V42HT66, Ireland to whom cheques should be made payable[or phone/text 00353876471956]. If payment by Electronic Funds Transfer (EFT) is preferred please email your name and address to lomahony@hotmail.com and you will be provided with the bank BIC and IBAN. Please remind the bank to include your name on the EFT. The members of each of our groups are sick and tired of the silence and inaction by government, both local & national, when it comes to cyclists’ safety. We have been calling for increased funding and resources for cycling and for the Garda Traffic Corps, so as to increase the member and officer complement from its present low of approx. 700 to a strength of 1,200, but those calls have fallen on deaf ears, and cyclists continue to be killed as a result. Just yesterday we had a report on Facebook of a club cyclist clipped by an overtaking vehicle while out on a club spin. It was yet another hit-n-run caused by dangerous overtaking, which is a statutory offence covered by the Fixed Penalty-Points regime. However we never see any statistics published by An Garda Síochána to show how many FCNs are issued for this offence. We need this vital data. There is silence and inaction from the key government ministers – Minister Ross (Transport) & Minister Flanagan (Justice) – who hold responsibility for road safety and policing, respectively. Dr. Paul Corcoran (Chair of Dublin Cycling Campaign) stated that “the number of vehicle fly-parked in the mandatory-use cycle tracks on the streets of our capital, and right across the land in urban areas, during their period of operation is unacceptable. Illegally parked vehicles force cyclists out into the fast-moving traffic-stream putting riders at increased risk of being hit. They are not an aid to doing business”. Clara Clark of Cycling Without Age, www.cyclingwithoutage.ie, “asks all road planners and users to respect and look out for cyclists on all our roads. We want Cycling Without Age trishaw trikes to become an accepted form of mobility for our older and mobility-impaired citizens. Cycling offers sustainable and healthy travel to all. Motorists need to recognise and allow space and for safe overtaking, safe road use, particularly at junctions, and parking for cyclists. We call on government and local authorities to consult with cyclists and cyclist groups when planning and upgrading new road layouts. For example, Cherrywood in south Dublin new road proposals offer unrealistic and bicycle-unfriendly junction options”. Stephen McManus for IBIKEDublin says: “Death by car should never become normalised in a society that cares for its people. Thirteen parents, children, partners, siblings have been killed while cycling to work, school or while just out going about their lives. The state must act immediately and make infrastructure safer for pedestrians and cyclists to avoid further deaths. The Dáil must also pass the Minimum Safe Distance Passing Bill into law immediately. We must all remember that roads are primarily designed to facilitate the movement of people. The people who choose the most dangerous mode of transportation must carry the most responsibility for the safety of other road users. Phil Skelton of ‘Stayin Alive at 1.5’ says: “Many motorists are simply not aware of the rights of bicycle riders and the challenges they face in navigating a road system designed primarily for motor vehicles, underpinning a stubborn prejudice that bicycle riders are “rogue” road users. The Stayin’ Alive at 1.5 campaign, has made use of social media, various awareness videos, vehicle signage, safety campaigns, press releases etc. to ask motorists to “give space” to bicycle riders. The RSA has been active in this area too, but this has been ongoing with cyclists for some time now and and although has some positive effect it doesn’t reach the target audience we need to engage, those who are might view people on bicycles as road furniture, as an inconvenience, which needs to be overtaken hastily and at the first opportunity. those unwilling to take on the message or dismissive of vulnerable road users altogether. Introducing a minimum passing distance law would be a significant and progressive step in changing the focus on sharing the road”. This Tuesday, 21st of November, we are joining forces as #Cyclist.ie #IBikeDublin, #StayingAliveat1.5, #DublinCyclingCampaign and #Cyclingwithoutage to let the Government know that the issue of cyclists’ safety can no longer be ignored. Join us from 5.30pm as we hold a vigil in memory of the people killed while cycling on Irish roads.